Free Books? Yes, Free Books! Hi-ho, everyone. Take a look at what came in the mail yesterday. 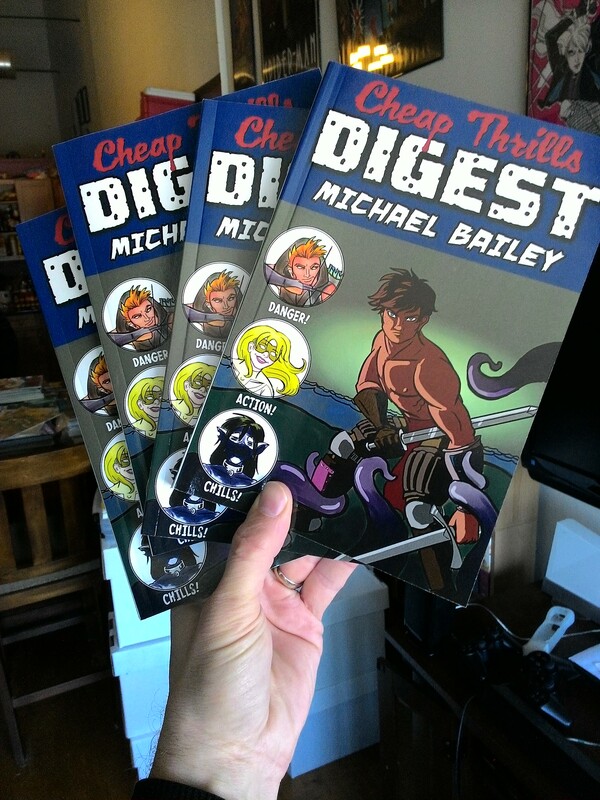 Yep, that is my very first shipment of Cheap Thrills Digest, my new collection that features short stories from the Action Figures and The Adventures of Strongarm & Lightfoot series; an original, never-before-published novelette, Lost Souls; and an updated version of my essay Critiquing Critiques – How to Leave a Review. Keep that last one in mind, because it’ll become important in a minute. This book will make its debut at Saturday’s Local Author Fair at the Worcester Public Library. For the foreseeable future I plan to keep this as a print-only book (no e-book version) that will be available only at personal appearances and, in the coming weeks, through this website. The giveaway will be announced on this website at 10 AM (EST) Monday, April 4. The free copies will be given away to the first ten people to respond. After I receive my tenth response, the post will be deleted and the giveaway will be over. One copy per person! Don’t be a book hog. When the giveaway is announced, use the contact page to send me a message that includes your name and a mailing address. The recipients will be publicly thanked by name on this page in a later post but mailing address info will remain confidential. No doxxing here. You don’t have to buy anything to get your free book, but you will need to include along with your contact info a link to a review you’ve left on Amazon for any of my other books, so if you’ve been procrastinating about leaving a review, now is the time to correct that! Innsmouth Look Publishing invites you to explore the worlds of author Michael Bailey in this collection of short stories and a previously unreleased novelette-length story. Protecting the innocent? That’s easy. Taking down crazed super-villains? No problem. Babysitting the youngest member of the super-team the Quantum Quintet, a little boy whose temper tantrums can level a city block? That could prove the toughest challenge yet for the teen superhero known as Lightstorm. Track down a small band of Hruk raiders, recover the valuable family heirloom they stole, and bring it back in one piece. It sounded like an easy enough job for the hard-luck adventuring team of Derek Strongarm and Felix Lightfoot, but as always, nothing is ever as easy as it first seems, and it doesn’t take long for their find-and-recover mission to turn into a hack-and-slash fight for survival. An innocent day trip takes a bizarre turn when former reporter Max Jeffers discovers a second-rate tourist attraction’s secret star: an allegedly real vampire. Fascinated by the strange woman, Max sets out to discover the truth about her — but will the truth set either of them free, or will it condemn them both to prisons of their own making?